Spectroscopic Methods in Mineralogy and Material Science covers significant advances in the technological aspects and applications of spectroscopic and microscopic techniques used in the Earth and Materials Sciences. 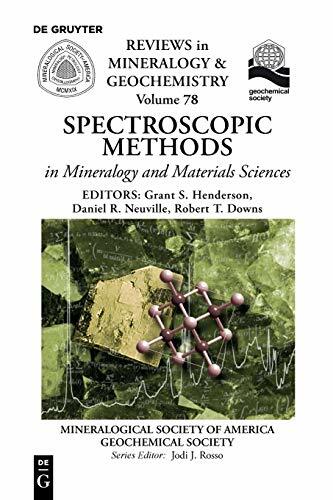 The current volume compliments the now classic Volume 18, Spectroscopic Methods in Mineralogy and Geology, which became an essential resource to many scientists and educators for the past two decades. This volume updates techniques covered in Volume 18, and introduces new techniques available for probing the secrets of Earth materials, such as X-ray Raman and Brillouin spectroscopy. Other important topics including Transmission Electron Microscopy (TEM) and Atomic Force Microscopy (AFM) are also covered. Grant S. Henderson, University of Toronto; Daniel R. Neuville, IPGP-CNRS, France; Robert T. Downs, University of Arizona.